Senior artist Vivian Lynn has for over 60 years been making critical and enquiring work. The recent selective survey I, HERE, NOW Vivian Lynn at the Adam Art Gallery Te Pātaka Toi, Victoria University of Wellington (25 October 2008–15 March 2009) curated by Christina Barton, offered a rich selection of over seventy works dating from 1950-2008. A book, of the same title, has just been published and makes fascinating reading, with essays by Christina Barton and Anna Smith, and short texts on specific works by Ian Wedde, Brian Easton, Pamela Gerrish Nunn, Priscilla Pitts, Charlotte Huddleston, Anne Kirker, Sarah Treadwell, and Guyon Neutze. Guarden gates, a significant work from 1982, is part of Te Papa’s collection. 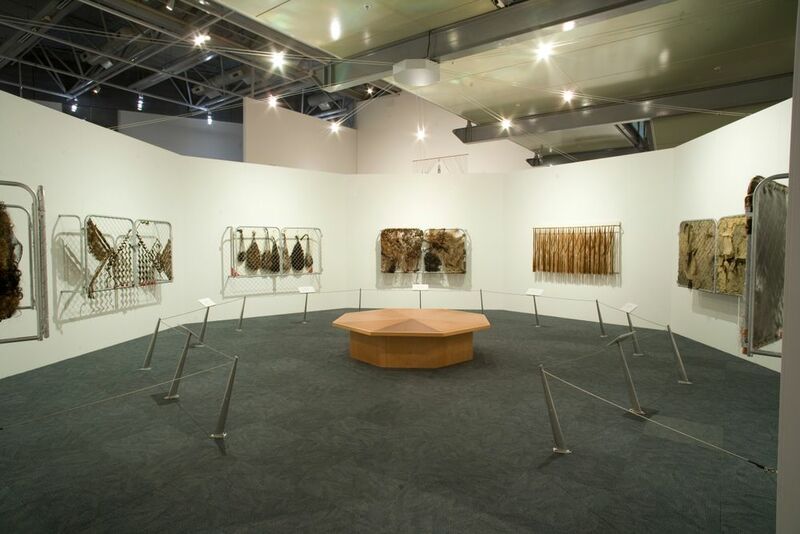 It comprises seven wall mounted sculptural forms made from cyclone gates, human hair and ribbon, and was a key focal point of the Te Papa exhibition We are unsuitable for framing, curated by Charlotte Huddleston which overlapped with the Adam Art Gallery exhibition (28 December 2008–26 July 2009). Each of the seven structures has its own title: Matrix; Daughter of the father; Sacrifice; Processual ground; Differentiation; Rebirth and Eyes of life, eyes of death. The combination of materials is evocative and visceral, and the formal arrangement of the suite of works heightens their arresting qualities. As Christina Barton comments in her introductory essay ‘Entwined with hair and other substances, Guarden gates demonstrates Lynn’s treatment of materials as generators of meaning. Together and singly the seven gates establish a complex interplay of opposites (organic and manufactured, structural and ornamental, inside and outside) that engage and contest the politics associated with her chosen materials’ cultural coding and which set out a poetic narrative referencing Jungian concepts of the unconscious. Barton, Christina, I, HERE, NOW Vivian Lynn – an introduction, I, HERE, NOW Vivian Lynn, Adam Art Gallery Te Pātaka Toi, Victoria University of Wellington, Wellington, p.16-17.